Q-Snaps. 14 1/2 Clamps Pair for 17 Frame  - $5.00 : Yarn Tree, Your wholesale source for cross stitch supplies. Item 2941. Two 14 1/2" Replacement Clamps for 17" Frame Sides. [original item SFCP5]. Replacement clamps to hold the fabric onto the Q-Snap frame. 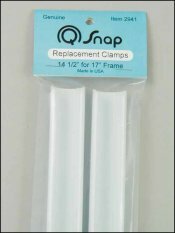 For use with the 11"x17" or 17"x17" Q-Snap frame (Item 2499 or 2495). Two clamps per package. This size is occasionally used on the edges of the table on the Sweet 16 Quilting machine. Please measure the length you need.